Chlorophyll is the phytonutrient that makes all these veggies so green and so healthy! Per request, I am adding this recipe to the mix and for good reason. For one, this dish is loaded with blood boosting chlorophyll which is great for building blood as it stimulate the production of hemoglobin and two, it's just too easy to make not to share the details. You can pack so many vegetables into a dish like this and it is a great way to diversify your veggie intake. Really, you can make this with whatever you have in your fridge. I went with the green theme here which is exceptional healthy for so many reasons it's hard to list them all, but what you really need to remember is that for all general purposes, use whatever you have on hand. Fried rice is like the new pizza, where anything can be a topping. 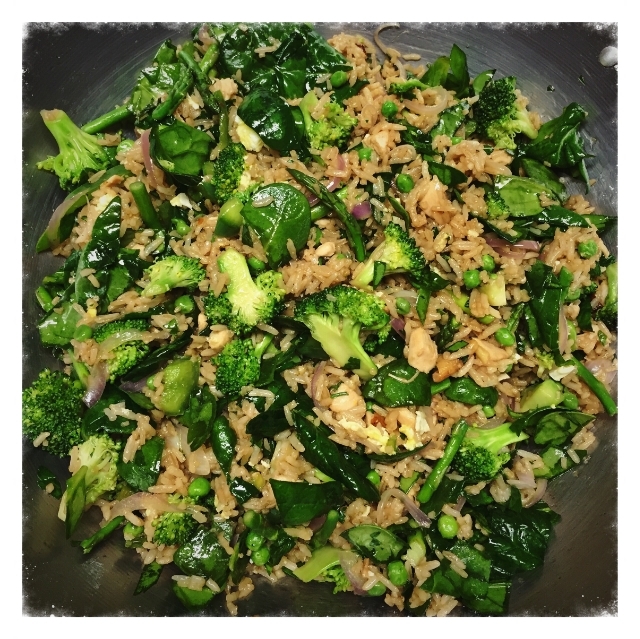 Even more importantly, fried rice can be a vehicle for a healthy dose of fresh goods. Leave the canned mushrooms and water chestnuts in the pantry and go with the fresh stuff. These are the ingredients that are going to contribute the most to your health and it's best to give them the run the house (aka: your body) without the hindrance of artificial ingredients, loaded with artificial chemicals that your metabolism struggles to recognize. Prepare all ingredients first and keep them separated. Mix the garlic, ginger, oyster sauce and soy sauce together and set aside. In a large pan (a wok is ideal) add a little oil and scrabble the eggs till cooked and then place in a small bowl off to the side. Next, saute the following vegetables one at a time adding oil as necessary: onion, pepper, broccoli, asparagus, and peas. Sauting seprately is important for controlling the final texture as different items will require different lenths of time to cook through. After sauting each vegetable, you can place them into a large bowl (the veggies can all be combined at this point so one bowl will work for all). Then saute the chicken (or any protein really). Once cooked through you can add it to the bowl of veggies. Add about 2 tbsp of oil to your pan and then add the rice. Saute it for a bit breaking it up as best as possible. Then add the soy sauce mixture and mix well with the rice. Once the rice is mixed with the sauce add the chicken and vegetables to the pan and stir everything around and combine well. Lastly, add the spinach. You might have to add a little at a time allowing the spinach to wilt some as you mix it in before you can add the rest. Give everything a good stir to combine and you are done! Let me just add some encouragement here that making this recipe is much easier than writing out this recipe. You guys can wing this in a pinch so just go for it! The key is truly having everything prepped before you start and then cooking items individually to control the final texture to your liking. I hope this recipe is helpful and cheers to blood health!